The government claims collecting the identity numbers will help weed out ‘ghost teachers’, but many fear the real purpose is to establish a surveillance system. Colleges and universities demanding Aadhaar numbers from their staff has caused disquiet. Although many have complied and submitted their 12-digit biometric-based identity numbers, they remain uneasy about it. Others, such as at the National University of Juridical Sciences in Kolkata and the Indian Institute of Technology in Delhi, have plainly refused. Most of India’s higher education institutions asked their teachers to submit Aadhaar numbers in the summer of 2017 soon after the central government made Aadhaar mandatory for availing a range of services. 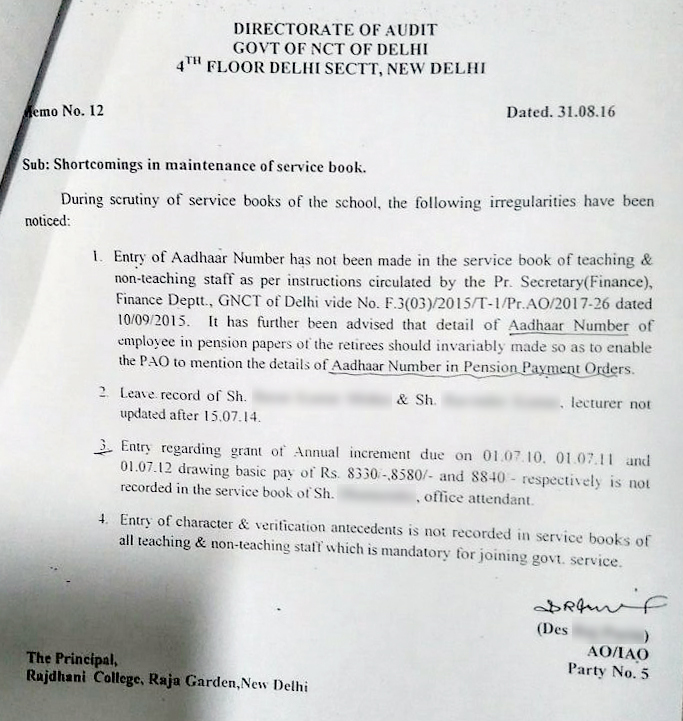 Teachers in Delhi University’s colleges, funded by the Delhi state government, though had been instructed to submit Aadhaar – to be linked to their service books – as far back as September 2015. At the law university in Kolkata, teachers were told to give the identity numbers for the Teacher Information Format, used for conducting the All India Survey on Higher Education, in April last year. Releasing the survey for 2017 early this year, Human Resource Development Minister Prakash Javadekar claimed that linking Aadhaar to the Teacher Information Format had helped identify over 80,000 “ghost teachers” in institutions of higher education across the country. According to NTDV, Javadekar said his ministry had discovered that the “ghost teachers” used “proxy methods and are apparently teaching at multiple places full time”. Most, he added, were in state and private universities. Teachers, however, are sceptical: they point out that using Aadhaar to identify “ghost teachers” will make little difference because teachers cannot moonlight for other institutions without the “connivance of authorities” – principals, owners and the local administration. If those in authority allow the practice of moonlighting to continue, a teacher at IIT Delhi argued, there is little Aadhaar can do about it. Teachers fear the real purpose of the exercise is to establish a system of surveillance: by linking Aadhaar to their attendance systems, teachers’ movements can be constantly tracked. Further, “genuine staff members” may suffer if the government starts using Aadhaar enrolment figures to determine “ghost teachers” and use it as the basis for distributing resources among institutions. An audit report criticises a Delhi University college for not linking the Aadhaar numbers of all its employees to their service books. The order for doing so, the report says, was issued in 2015. What has deepened the disquiet is that the institutions have been vague about how the data would be used. Most have instructed their teachers to submit the Aadhaar numbers without bothering to explain why they were being sought. At Delhi University, teachers suspect their Aadhaar numbers will ultimately be linked to a biometric attendance system, an idea the university has toyed with for years. “We were first asked to submit some months ago and were told by the college that the Ministry of Human Resource Development wanted the numbers,” said Naveen Gaur, who teaches physics at Dyal Singh College. “Then just a couple of weeks ago, probably in February, we again got a letter from the principal saying the University Grants Commission needs us to submit. Some of us are very concerned that this will be linked to the attendance system and every bit of our information will be available and all our movements tracked.” Gaur is holding out, but believes that most teachers will have not an option but to comply soon. A physics professor at Rajasthan University held out for over a year before reluctantly submitting his Aadhaar number a few weeks ago. The university had issued a circular asking teachers to provide their Aadhaar in April 2017, claiming it was being done at the instance of the human resource development ministry. “Aadhaar is a personal identification number, just like my driving licence,” explained the professor who asked not to be named. He complied after being told that “everyone has submitted”; he feared his salary would be withheld if he did not relent. “Aadhaar provides, or facilitates, an opportunity for centralised surveillance by those in power anywhere,” he said. He is part of a group of four-five teachers who have “explicitly refused” to provide their Aadhaar numbers. Another teacher who is part of the group said, “There are plenty of reasons to oppose mandatory submission of Aadhaar – ranging from absence of legal authority, breach of privacy, potential for surveillance by state on academics, contempt of Supreme Court’s interim orders etc,” he said. The teacher said after they refused to comply with the order, they were not pressured any further. Nor was a small group of teachers resisting a similar directive at IIT Delhi. One of them said he worries about identity theft. “I am not convinced about the security network [supporting Aadhaar],” he said. The engineering college had asked for Aadhaar numbers about a year ago. Then, when new identification cards were issued about three months ago, there was a column for Aadhaar on the information gathering form. 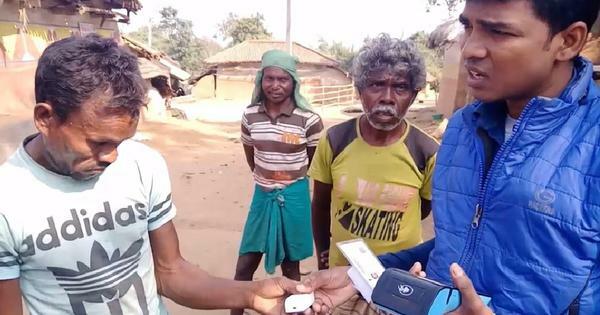 He had sought an explanation but the agency contracted to make the cards did not insist on having the Aadhaar number. “There was no big hue and cry about this,” he said. 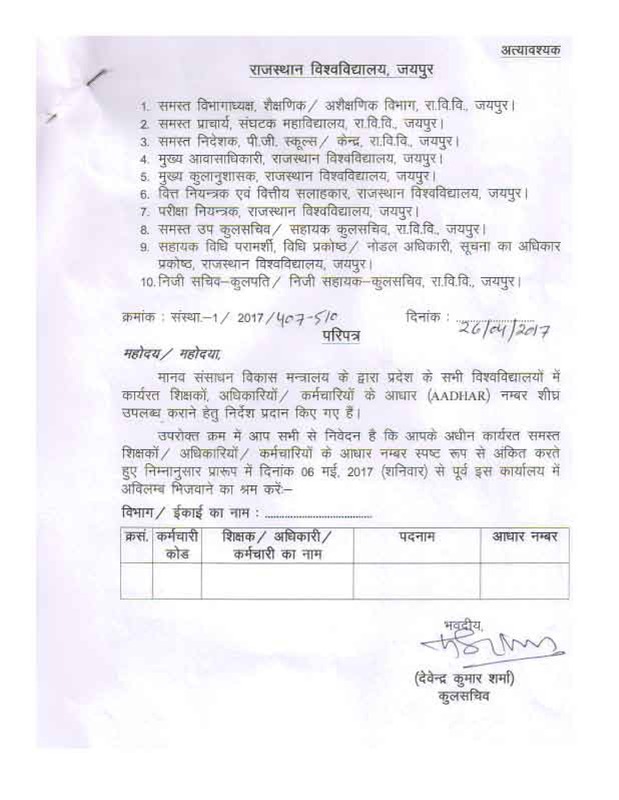 A circular issued by Rajasthan University asking teachers to submit their Aadhaar numbers as directed by the human resource development ministry. At the National University of Juridical Sciences and the Indian Institute of Management, Ahmedabad, faculty members were told that their Aadhaar numbers were required for completing the higher education survey and ranking processes. The dean’s note said the Aadhaar numbers were also required for the institute to participate in the government’s ranking system for higher education institutions, the National Institute of Ranking Framework. “In case we are unable to furnish the Aadhaar Card details of faculty members, the loss is ours as that many faculty members will not be counted under faculty strength, impacting our faculty – student ratio when data is used by the government from the survey database,” it stated. Teachers complained that the ranking system is now being used as “a pressure point”. Reetika Khera, who teaches at IIT Delhi, wondered if the government’s refusal to count teachers who do not submit their Aadhaar would affect their ranking. Deliberately undercounting faculty numbers could lead to higher student-teacher ratios, an “important metric in the calculation of ranks”, she said. Scroll.in emailed each of the institutions mentioned in this report, asking to explain why they were collecting Aadhaar numbers and what they planned to do with them. None have responded yet. If and when they do, this report would be updated. “It has so far not been a marker of entitlement or rights,” he said, referring to the survey. But he fears if the ministry and the higher education regulator, the University Grants Commission, start using the survey as the basis for allocating funds, projects approvals and transfer of grants, the “classification” of teachers without Aadhaar may lead to “the same type of exclusion that has been seen with [the Public Distribution System] where beneficiaries without Aadhaar linkage have been declared ghosts”.